banaras ka khana: tamatar ki chaat | the famous tamatari chaat of Banaras and some pictures from dilli haat..
tamatar ki chaat | the famous tamatari chaat of Banaras and some pictures from dilli haat.. I know I know many of you are waiting for the tamatar ki chaat as I promised. A stupid dengue (the simple kind thankfully) was keeping me from making this wonderful chaat. After a week of khichri, soup and sandwich kinda food I am back to my pleasures of cooking. Red luscious tomatoes were waiting to be pulped, mashed and thrashed into a flavorful chaat which reminds me of my just married days. Yes it was during our dating days and after the wedding that Arvind introduced me to the varied chaats of Banaras otherwise I would have been deprived of this heaven. On one of the occasions when we ate this tamatar ki chaat at the Sankat mochan mod (the turn towards sankat mochan mandir in banaras) I watched the chaat wala pulping the tomatoes and mixing ingredients to make a yummy dona (a serving dish made out of leaves) of this tamatari (it's also called tamatari or just tamatar), came back home and made an exact version of home made tamatari. This time I guess I made it after years, although I have been planning to make it for a long time. Not only because I had a few people requesting for it, also because whenever I ate this tamatari in the past couple of years in banaras, I found to my utter disgust that it has transformed a lot, read deteriorated. It has got commercialized I guess. Yes, believe me the tamatar ki chaat in those days (12 years ago) was much simpler and more tasteful. The thelawala would mash a couple of already roasting tikkis with a couple of tomatoes on the giant tawa, mix some chutneys, sprinkle some tidbits and serve you the most simple looking yet uniquely flavored chaat, with a rich flavor of tomatoes, you would inevitably end up asking for one more helping. On the display (as you see here) it looks like the bhaji of the pav bhaji combo, as it is a mashed chaat and is cooked on a tawa. But the similarity ends here as this a completely different flavor, rich tomato, some dry fruits and some khoya and and lot more subtle flavours. I had to make the miniature namak paare first, store bought namak paare can be used but I did not have any and as I did not have any maida too, I made them with whole wheat flour. makhane( lotus seeds ) 10-12 nos. I used an iron kadai for that taste of chaatwalas (otherwise too I prefer cooking in iron or cast iron kadais)..
Chop the tomatoes in small cubes and keep aside. Mix the milk powder , garam masala powder and red chilly powder with a tbsp or two of water to make a pasteand keep aside. This step is not required if using khoya. Mash the potatoes, add salt to taste and 1 tsp of black pepper powder, 1/2 tsp of green chillies and 1/2 tsp of chopped ginger. Mix well and shape a large tikki with the mash. Keep aside. Mix and smash the tikki now and fry the mixture thrashing the tomatoes to make a smooth yet textured chaat ....Takes about 2-3 minutes ..
wow..really intresting post...you've done a good job..never heard or had this chaat..drooing ! looks inviting..
Gosh, you put so much work into this post. Not just to give us the recipe and an image of the finished dish but to also take step-by-step photographs. Thank you for your hard work. never had such a version of tamatar ki chaat but sounds so delicious! loved the street snaps too. Thank you lovely ladies... try it once and i bet it will become your favorite chaat. Rebecca .. yes it's been a long time , but you are always welcome ...i keep reading your posts too n i know you had a great time here in India. Cynthia...Yes uploading and arranging the pictures took more time than making the chaat itself :) but the effort is worth as many of my real life friends have been pestering me with this. PJ ...these are pictures of a chaat stall at Dilli Haat..
oh sangita, u have loads of patience to make all these, i dunno if i ever have even an iota ofwhat u have hats off to u greatt. i have never heard of tamatar chaat. 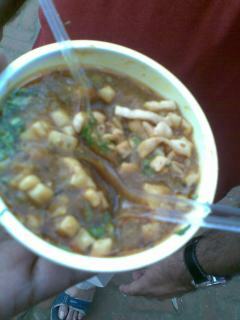 looking at the pics and a nice presentation, I think I should try the tamatar chaat at home. i really appreciate the effort you put in your posts and pics. the posts are informative and the pics are illustrative. it helps people like me who do not know much about the central indian cuisine. by the way, i will soon try your baingan fry recipe in mustard paste and will let you know. @ devasena... i shall make it for 4 hungry souls , why didn't you include your husband haan !! @ Dassana ...this kind of patience does not come very often to me :) Although i enjoy cooking good food for the two of us. All those pictures are worth posting especially if they are appreciated by people who are new for this kind of flavors , thank you for the generous comment. Do tell me whenever you try the recipes. Thanks for bringing back the Dilli Haat memories. Your chaat will keep me craving for it all day. i thought abt it dear, while posting this comment..feeding one humble hungry soul like me itself will make u toil in the kitchen all day.. Nevertheless we dont want to disappoint u, let me know the ur address, we will be there. Both man and woman. This is such a wonderful blog!!! All those fingerlicking recipes!!! WOW !!! 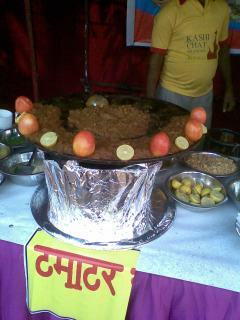 This tamatar chaat looks really really yummy. I'm sorry but you mentioned Delhi Haat.... what does haat mean? 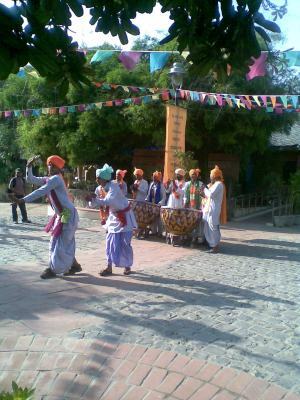 Dilli Haat is a craft bazar where artisans and craftsmen come from all over the country and sell their merchandise. Inside the haat premises there is a food plaza too where you get authentic food from all the Indian states. Thankyou for posting, now could send us some of it!!! Sangeeta, thankyou for sharing this recipe! thank you sangeeta g for sharing this wonderful recipe, i only once in my life had tasted tamatar ki chaat at the age of 13 or 14.... ever since i wanted to have it... now after more than 10 years my dream is fulfilled, all thanks to you. by the way i used cheese-lings instead of namak paaras, it turned out to be good... i also gave a miss to the makhanas but added almonds.... so the end result was delicious.. keep up the good work. god bless you. I am so glad to hear that you made it Jimmy...and i can guess after these many years of having tasted this chaat how happy you must have been to try this...reading your cheeselings replacement i feel like making it again , the husband would be so happy i know. I will never replace the makhanas with anything , they provide a nice texture and taste to the finished chaat...try that once you would know why i say this. Came here from Poonam's blog...hummm..only you can make such elaborate chat...great! 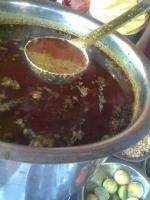 Thank you for the recipe, i came back from banaras yesterday and thought of searching for tamatri i has there and wow! i found it. will soon make this. 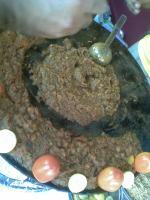 yesterday i came back from Banaras and was looking for the yummy tamatri i had there, wow! i found it i will sure try it, thankyou. 2 years on since the last comment and this remains a recipe I return to with glee since I discovered it. When I'm lazy, I buy gathiya instead of making the nimki or namak pare. I am a Delihite but married to a family in Varanasi, since last 2 years. So, Varanasi is my sasural now. I have heard a lot about the tamatar chaat there. Your recipe looks delicious. But if I skip the khoya part, do you think it will still be a tasty chaat. Hi Kamayani, I think the khoya adds a different dimension to the tamatar chaat but you can try without it too. You can balance with some cashew paste in that case. When do you add the Makhana? Sorry for the confusion Nandita Amin. Makhana is added just after ghee is heated and green chillies etc are added, as shown in the first picture of the step by step procedure. I hope it is clear now. Big fan here Saengeeta. It is 2AM here and just before going to sleep reading up some inspiration here. A few years ago when I was in Banaras I could not taste this (being visitor to my nanihal, had been stuffed and could not take anything more), but did notice that some vendors add this label full of rasa on top - when serving. Wondering what that is for. Thank you :-) That rasa is different at every chaat wala and you will get as many tamatar chaats in Banaras in as many places you visit. Try this version of mine you would possibly like it too.